INDUSTRY.co.id - Yogyakarta - Jogja International Furniture and Craft Fair Indonesia (Jiffina) 2018 at Jogja Expo Center, March 10-13, recorded transaction value reaching US $ 64 million from target of US $ 100 million. The value of these transactions decreased when compared to the title of Jiffina 2017 which can reach US $ 78 million. 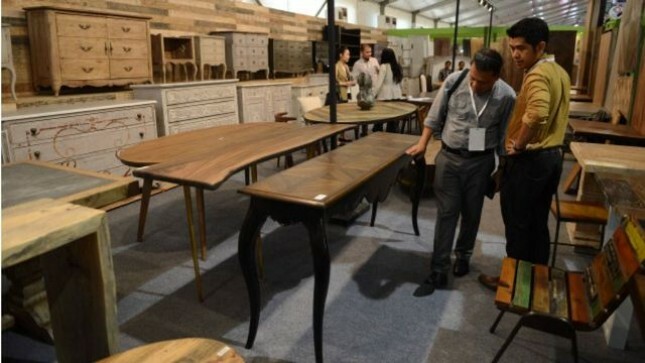 "Although not in accordance with the target that we specify, the achievement of transaction value is not too disappointing us," said Chairman of OC Jogja International Furniture and Craft Fair Indonesia (Jiffina) 2018 Endro Wardoyo at the closing of the exhibition at Jogja Expo Center (JEC) 2018) evening. The decline in the value of the transaction, according to Endro, is triggered somewhat by the sluggish purchasing power factor in the uncertain global market situation. "This achievement is quite realistic to see similar furniture exhibition conditions such as in Singapore (IFFS 2018) and in Jakarta (IFEX 2018) which also experienced a downward trend," he said. Endro mentioned a total of 3,843 visitors from 40 countries attending the four-day exhibition, consisting of 858 foreign visitors and 2,985 domestic visitors. "Overall 'buyers' who were present asked to be escorted to visit directly the factory or showroom of the exhibitors," he said. Jiffina this year is participated by 300 participants of furniture entrepreneurs from Yogyakarta followed by Central Java (Solo, Klaten, Semarang, Jepara), East Java and Bali. They showcased a variety of furniture with models and designs ranging from minimalist, rustic to recycled wood. "The product variants that are most interested buyers are still furniture made from recycled wood," he said. In the exhibition of international furniture and handicraft that carries the theme of "Indonesia Orginal Unique Firniture & Craft Product", foreign buyers benefit because they can transact directly with the businessmen or craftsmen in the country, without going through an intermediary through the program "Factory Visit". "In general, the exhibition booth and exhibition theme that we lift this year get appreciation from the buyers and visitors," said Endro.